- Victoria's process to continually improve and deepen the well in which she draws from in her craft. - Victoria's method of regular self-care. - How Neil Gaiman opened her eyes and blew her doors open to the many possibilities that exist for creators. - How creating something for yourself can have an unimaginable impact on your success. 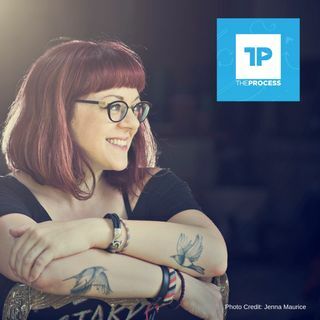 Episode #19 of "The Process" is with author V.E. Schwab. Victoria or V.E. Schwab is an ... See More international best-selling creator of engrossing worlds. What struck me first in my conversation with Victoria is that she has an enormous heart. The day her and I had this conversation I was less than 24 hours removed from a personal tragedy. I was emotionally fried while running on no sleep, and I had a very real fear that my brain was going to quit on me in this talk that I had been looking forward to for months. I took some time pre-interview to explain and apologize for what was going on, and she reacted with pure kindness, understanding and empathy. So, in addition to the fact that her books are incredible and more than worthy of your time and attention … the reason I’ll personally be a lifelong “Schwablin” and ambassador for her creations is because she’s an amazing human being with a kind and generous heart. To listen to this episode of "The Process with Brad Wilson" podcast, click that download or play button now.